This is Kira Abricossova and a gazelle by the name of ‘Aden'. They are on board the Maloja in September 1938 (photographed by Patricia Mary Cape, in the collection of the National Library of Australia). Looking at this photo, it is what I think of as happiness, and happiness, the very finding of it and recognising of it, why, this ought be in own way somehow celebrated. Documented, more often than not. Treasured, possibly, yes. And kept in the pocket for the warm embrace of memory. Louise and I are tipping our hats to celebrating a moment, be it momentous (as is the case today) or smaller in scale. We have created ten collaborative collages with a tilt towards celebration. Ten collages for you, Hila, to say, in our way, congratulations on your book being both complete and published. Congratulations on it being a thing that in other hands it will rest and come alive both at one time. A book is a tremendous gateway to thoughts and actions and greatness, and you, dear friend, you’ve written one. In coming together to make these collages to mark Hila’s triumph, we asked ourselves what would we like to do for a celebration. Being quiet and oft mole-like, this would perhaps mean an amble about the zoo on an afternoon. A punnet of hot chips shared in front of the seals as they spin, spin, spin in the blue watery pool. A delightful scene to watch, the happiness of seals performing all manner of loops, flips and incredible contortions. What I would not give to join them, were I naturally with flipper, and invited. Or, possibly, to a film we would go, in the decadent middle of the day. Or to a performance, if lucky and the funds were there for the spilling. Or a quiet night of leisure in one’s pad, knocking about in pyjamas early in the piece. It strikes me that our plans are decidedly low key and very relaxed. No silver lame dress to slither into and no tremendous wildness to go with the thrill. In recognition of Yippee! Hurrah! We did it. 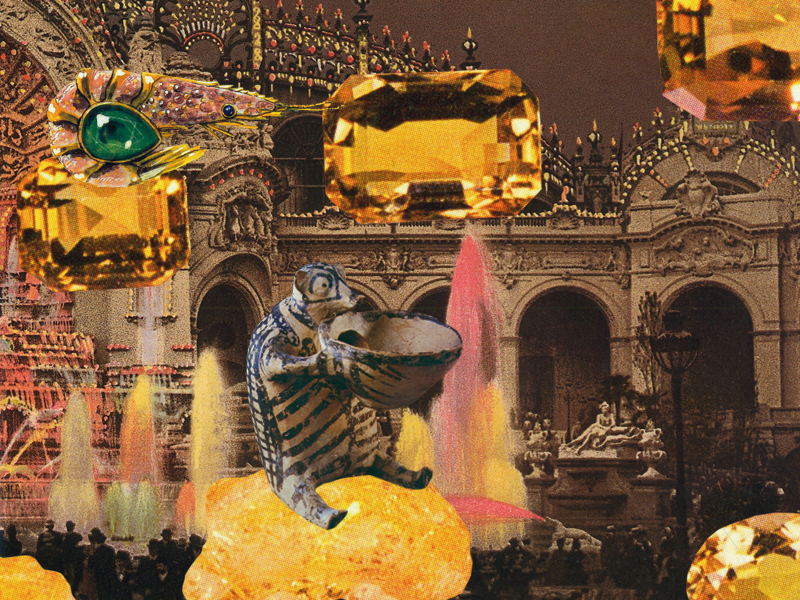 Perhaps, too, for any wildness and glamour, we can through our collaged creatures and fantastical scenes live. For now at least, that is the plan. 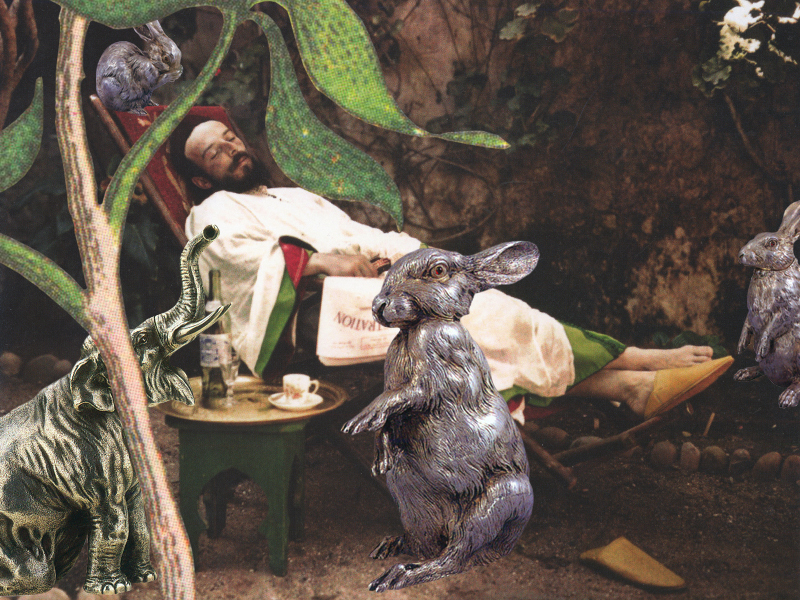 Gathered here in these ten collages are scenes both of wildness to live vicariously through and ones I would like to step into in some way. There are peasant dancers in a cabin, as photographed by Kirchner. And ladies taking tea outdoors, a table of silver tea things upon a crocheted cloth before them. A table laden, always must it be laden, with cakes for the sharing. And with people. Plenty of people, for I always feel like Hila is talking to me when I read her words here in this space she has carved out that is so full of conversation and ideas offered freely. I literally gasped when Gracia and Louise sent me their guest post. It’s actually more of a work of art, than a blog post. That they would go to this much trouble for me, and create such artwork from scratch, tells you a lot about their generous nature. I’m so lucky to have ‘met’ them online (alas, we missed out on meeting in person in Melbourne — next time). I really don’t know how to thank you Gracia and Louise, this is a gem of a post. Visit their website to view more of their art. Celebrate with Amy Borrell, Kate Miss, Rachel Ball, Jen McCabe, Jessica Stanley, and Jane Flanagan.